I was just reading an old scrapbook magazine featuring a layout of "a woman preparing to have a baby." If I had to title Ellie's birth story, it would be the story of a woman UNPREPARED to have a baby. Now I knew that I was turning 38 weeks on Wednesday, February 1, and that marked the beginning of the "any day now" period. However, it did not occur to me that this was not a hard and fast rule. I'm a very by-the-schedule sort of person who lives off her planner, so the concept that my child would not follow this philosophy simply didn't cross my mind! On Tuesday, I was feeling sick with a cold so I worked from home. S and I had some Chinese food for dinner and watched Downton Abbey (we're watching Season 1 on Netflix and are hooked! ), and then headed to bed early. I woke up at 1:30 AM to use the bathroom, and something strange happened, which I later realized was my water breaking. After spending a few minutes trying to convince the doctor and doula that I was just losing my mucous plug, and I couldn't be in labor because my bag wasn't packed, the contractions started in earnest. And that's where the fun began, ha! I realized pretty quickly that (1) I was having back labor, and (2) back labor really is as bad as they say it is. I try to block the next several hours from my mind, especially since I hope to have another one! Settling into the hospital room was stressful, but I loved my nurses and my support team. After 45 minutes of pushing, Bunny was born at 12:12 PM. It was such a surreal moment and still is. I can't believe that she's mine. She despises her bassinet. Good thing we just borrowed it! Hope to be back soon with some fun scrappy projects! And just to liven things up, tell me something random about YOU! Oh Keshet, Ellie is absolutely precious. I had back labour with my daughter and I hear you sister! Enjoy getting to know your wee dot. They are surprisingly good at making their demands clear. She is GORGEOUS!!! Random thing about me... I lived on Guam for a year. Congrats! She is so pretty!!!! Random thing about me - I grew up vegetarian. So very happy for you! She's beautiful! Gorgeous! Congrats to you and your family! she is just a doll and i LOVED reading this!!!! so happy for you!!! your water broke at 1:30 and she was born at 12:12. you are a rockstar first time mama!!! Beautiful little girl - thanks for sharing more info about her - looking forward to more pictures and your first baby scrapbook pages! Random fact about me: I love birds. I would have one in a cage if my husband would allow it! She is so beautiful! Random fact... I was a chorus member in all of our HS musicals! What a beautiful little blessing. Congrats! Random thing about me: I won a dance contest at a club in Korea. Ohhh...she is so sweet. Babies are so amazingly wonderful! well with my little girl is was always gas. Laying her down on her back and doing the 'bicycle' with her legs always helped. Not only with the gas but I think it was fun for her too. It usually did the trick. Oh, I remember those days! The best advice a mom/friend ever gave me was "surrender"
But I remembered her saying that with my second baby. Just surrender to it and enjoy. I just relaxed and enjoyed my baby and it was more stress free. I slept when she slept if I could. Let the laundry sit an extra day or two. Didn't try to do it all. She is so beautiful, Keshet. I'm looking forward to many more stories, photos and layouts! She is beautiful! And every day will be a mysterious blessing. Just when you think you've figured it out ... something new will happen. But you will get through it and it really is the most wonderful thing. Nice to read her story!! She looks so sweet with the bow hat! My niece sounds similar to your Ellie - loved the cradle swing thing and never took to her bassinet (a pricey gift from my sis's friends .. oh well). But be aware they go through phases with things, she may start liking the bassinet or she may grow tired of the cradle swing. Gorgeous baby and such a lovely story! My pediatrician also taught me the lion in the tree technique with my little ones. So happy for you Keshet. 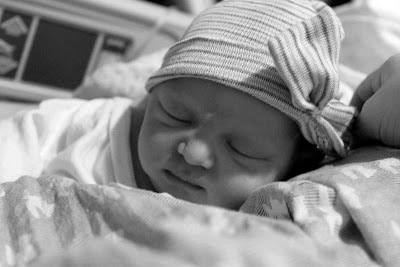 Loved reading Ellie's birth story! She is beautiful! and so blessed to have such a lovely mama : ) So happy for you all! she's beautiful! So now you share a birthday with your lovely little miss? I love that! My oldest was born on my birthday as well and it was the best birthday present ever! Congrats to you your husband and your little sweetie. Boy I am late to the party. I remember when my daughter was a baby, and I could not figure out why she was unhappy. She was fed and clean. So I decided to start from scratch and undressed her to find out that a string from her outfit was wrapped around her tiny toe. I was so upset, it was actually starting to turn purple. The reason for sharing this, is once I shared it with a friend a few days later same thing happened to her baby. So I like to share this with all new mommies.